** Important Note: LSU Graduate Programs DO NOT have Degree Audits; therefore, an LSU Graduate Student DOES NOT have the Degree Audit link under Student Services when they log into the myLSU Portal. More information can be found on the Degree Audit: LSU Overview. 2. 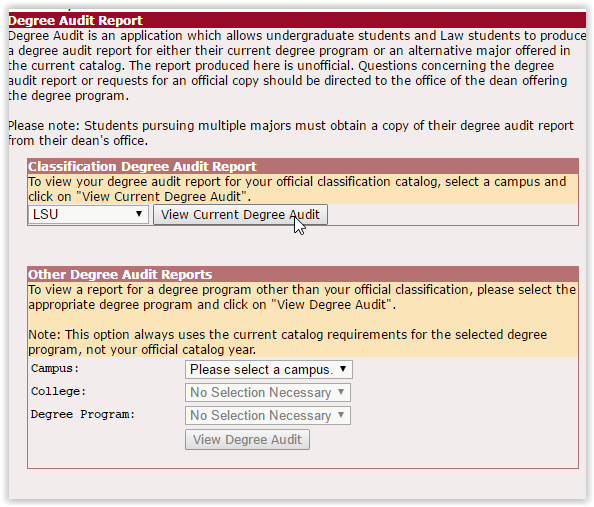 On the left hand side panel, click Student Services | Degree Audit. 3. Select your Campus (LSU or LSU Law Center) & click View Current Degree Audit.